A little bit of Cheer…. Hope you’ve had a wonderful Christmas. Here at OConnell Towers we’ve been busy with work and it was lovely to relax for one day with all our extended family. Over at Sketchabilities we have this project until the end of the month. 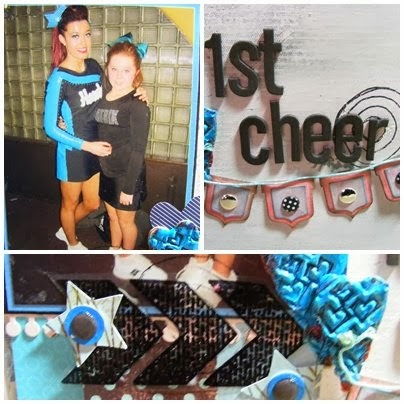 I have incorporated a photo of my daughter and my niece on her first Cheer leading Competition at Blackpool Winter Gardens in November. The frame and canvas (stuck together) were from The Range reduced to £2 and had the photo of a cat on it. I covered the canvas with 2 coats of white Gesso. I then used my trusted background stamps of ‘wine stains’ from Bo Bunny and ‘Friends’ stamp from Hero Arts. I then used different backing papers, Sizzix primitive heart, Cricut George and Basic Shapes – star, Hero Arts chevron stamp heat set with WOW Ebony Embossing Powder on Acetate, 2 x wooden pegs, Spellbinder flags and card candy. The hearts are triple embossed with Apple red, opaque azure and platinum WOW embossing powder. The letters are made of funky foam and already die cut. A piece of covered wire holds the flags. Awesome layout! Love the colors and layering! Thanks for playing along w/sketch #105 at sketchabilities!